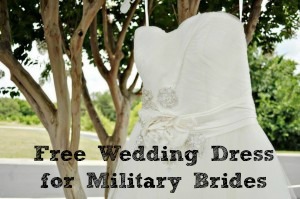 There is a fun freebie available for Military Brides! You can get FREE Wedding Dress. The dresses are available through Brides Across America. Most of the dresses are samples or overstocks, but are from top designers. To get a dress you must be engaged or had a civil ceremony. Your wedding must be within the next 18 months. You or your fiance also must have been deployed to Iraq, Afghanistan, Qatar, Bahrain, Libya, Kuwair, Korea, or Japan within the past 5 years. You will also qualify if you or your fiance have an upcoming deployment. Alternations are extra, but when the dress is free, this is a steal! You must register for the event ahead of time. You can see all of the details here.